Broth-based soups can be a healthy and filling way to start off a meal, but cream-based soups tend to be higher in calories and thus not as healthy an option. 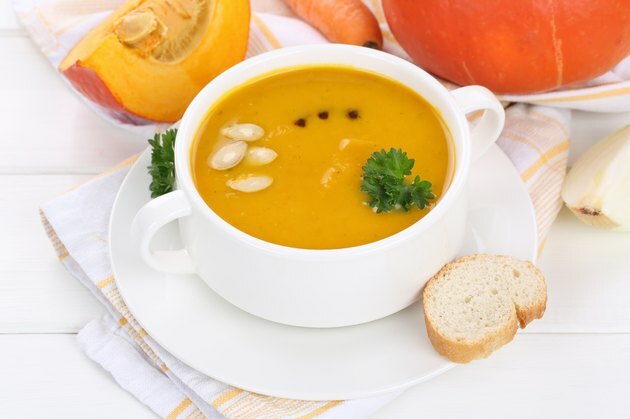 Pumpkin soup can be made in a variety of ways, some of which involve the use of cream, so the calories in each serving of soup can vary widely depending on the ingredients in the recipe. A typical pumpkin soup made with pureed pumpkin, chicken broth, cream or canned coconut milk and spices ranges in calories from about 152 to 206 per serving, with each serving consisting of between 1 and 1.5 cups. This serving size is more suitable if you're using the soup as a starter. If you want to make a meal out of the soup, you'd probably double the serving size, and thus the calories as well. Some versions of pumpkin soup are much higher in calories than average, with as much as 419 calories in a serving of about 1.5 cups. These soups are made with added high-calorie ingredients, such as cheddar cheese, and a higher proportion of cream to chicken broth. Some versions of this soup also contain added butter or olive oil, which increases the calories. Using milk instead of cream or a higher proportion of chicken broth can help lower the calories while still producing a flavorful soup. If you make your soup with pureed pumpkin, chicken broth, skim milk, onion sauteed with a small amount of margarine or butter and spices, it can have as little as 60 calories per cup. Instead of using high-fat ingredients to add flavor to your soup, use herbs and spices. Some spices that go well with pumpkin soup include curry powder, garlic, ginger, hot pepper flakes, mustard seeds, cardamom, coriander, cumin, nutmeg, cinnamon, cloves, chili powder and cilantro. Adding additional vegetables can also improve the flavor of your soup. Nonstarchy vegetables like onions and carrots will add fewer calories than starchy vegetables like potatoes, but pureed potatoes can help give the soup a creamy texture without a lot of added fat.